Benjamin recently graduated from Brown University (’17) with a degree in Neuroscience. 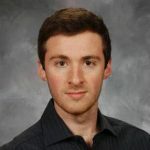 As an undergraduate researcher in the BrainGate lab at Brown, his research supported the development of a new framework to allow greatly improved calibration speeds for neural decoding. Furthermore, his senior honors thesis focused on the detection and classification of different behavioral states derived from underlying neural data. Benjamin now works as a Computer Programmer at BrainGate, where he helps to develop smaller and faster embedded brain-computer interface systems.